On Wednesday, I was delighted to represent the University of Nottingham at the second, annual Indian Student reception held at the Indian Community Centre Association (ICCA). 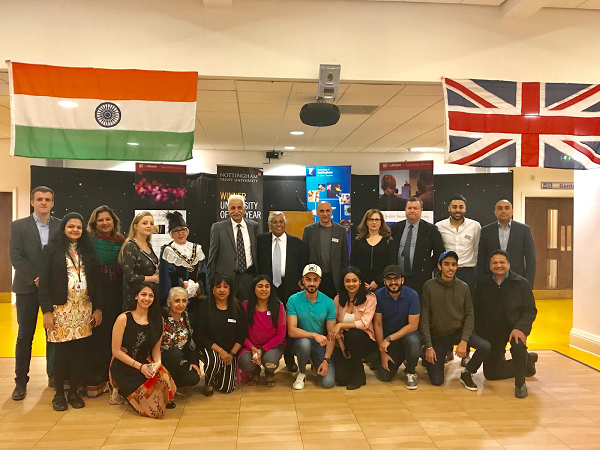 A collaborative event with Nottingham Trent University, British India Business Forum and ICCA, it was a chance for us to welcome new students to Nottingham from India. It was a great evening with over 300 students participating. The Sheriff of Nottingham, Councillor Catharine Arnold spoke at the event and formally welcomed the students to the City, stressing how welcome and important they are to Nottingham. Alumna and alumni from each of the Universities spoke about their time at Nottingham. Shraddha Badoni and Shrenik Parmar both spoke incredibly well and were passionate about their own time in Nottingham and the opportunities presented by studying in Nottingham. The event is now in its second year and represents a very strong collaboration within Nottingham. The event showed the strong community links with India and how the Universities support those links. Dr Jaswant Bilkhu spoke about the history of Indian nationals in Nottingham and Kashmeera Gorecha introduced ICCA. The speeches were followed by superb entertainment both traditional and contemporary and some great food. A really fantastic evening, full of energy and enthusiasm!